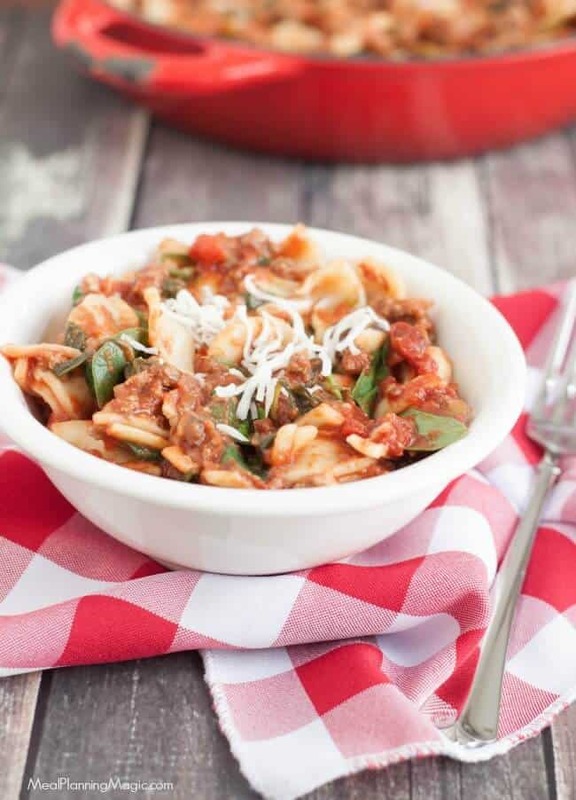 You’ll want to make this Super Simple Skillet Lasagna Florentine over and over! 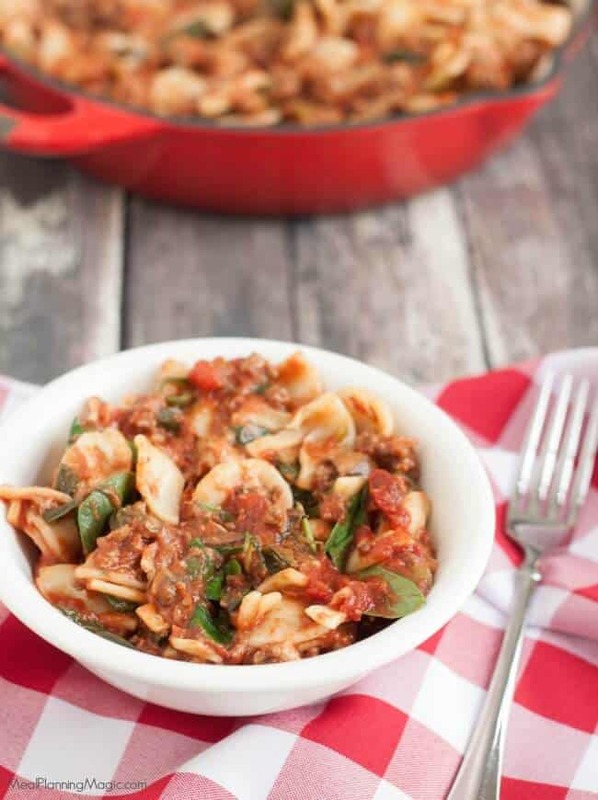 So delicious and full of vegetables plus easy to make, it makes a great weeknight dinner! 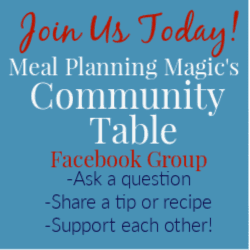 I love finding new-to-me recipes that make dinner time simpler and that my whole family loves. That’s a win-win in my book! My aunt emailed my mom, sister and I this recipe for Skillet Lasagna Florentine well over a year ago as it was one of her favorites! I’m not sure why it took me so long to try it but once I did I wished I had made it sooner because it was a huge hit with my family too. It has now become a staple in our dinner rotation. And being that I can make it easily all in one pan, just like this Spanish Rice and Beef Skillet Dinner that makes me an even bigger fan. I’ve modified my aunt’s original recipe a bit by changing up a few of the ingredients and the method. 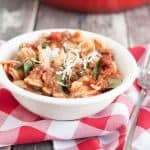 Her recipe uses the large lasagna noodles layered in the skillet but I decided to change the type of pasta to make it an easy to stir and serve dinner. Aside from it coming together so quickly, what I also love about this Skillet Lasagna Florentine is that it’s an easy way to add some vegetables to our diet. I’m always looking for ways to add more vegetables to the meals we eat. I will let you know that my husband and son are not big fans of mushrooms but in this dish, it seems to work! Occasionally they will pick them out but not always—so something is better than nothing, right? I like to use the frozen onions and bell peppers that are already chopped from the freezer section of my grocery store. I save time and often money (bell peppers can get expensive sometimes! ), so I pretty much always have these on hand. Add in the spinach and marinara sauce and you’ve got five different types of vegetables going on in one bite! 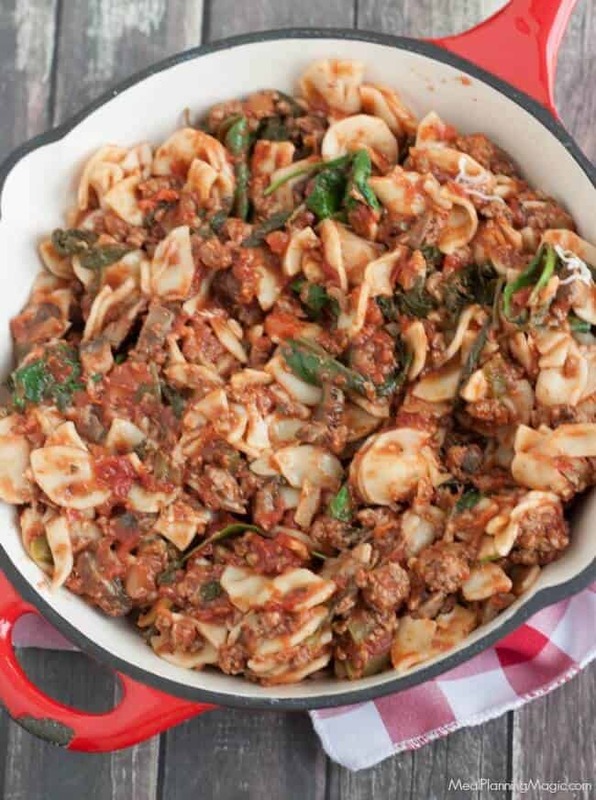 You could also substitute the ground beef for Italian sausage to add a bit more zip to the dish with a little extra spice. Just choose your family’s preference. Paired with a garden salad, this Skillet Lasagna Florentine is a healthy dinner that I hope your family loves as much as mine does! In a large skillet, brown ground beef until cooked. About 5-7 minutes. 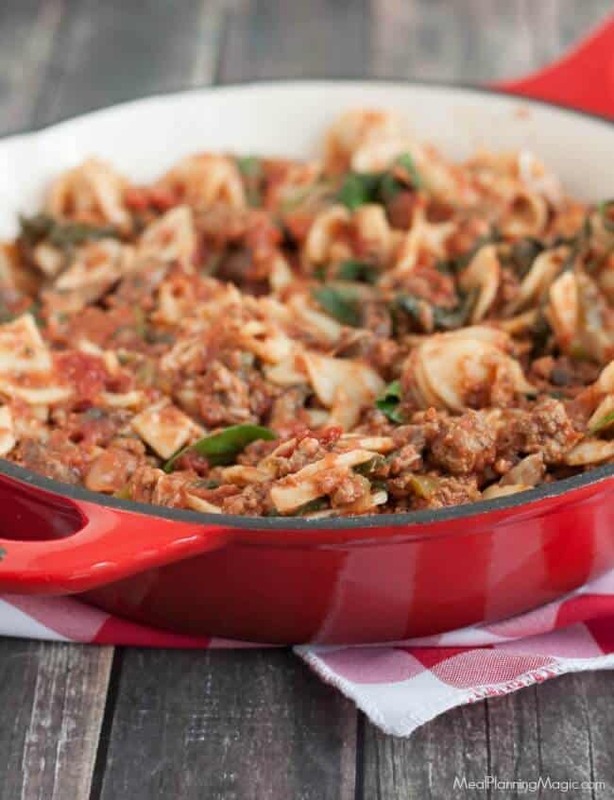 Remove ground beef from skillet and drain fat. Set aside. Add mushrooms, onions and bell peppers and saute until tender. Add cooked ground beef to vegetable mixture in skillet. Add marinara sauce and stir to combine. Simmer for 10 minutes. Add cooked pasta and spinach and stir until spinach is wilted but still bright green. Sprinkle in cheese and stir just to combine and heat through. Remove skillet from heat and serve.